In the heart of the Green Mountains, family freindly, close to skiing, (Stowe, Sugarbush, Mad River and Bolton), hiking, fishing, ( bass & trout), golf, mountain biking (the famous Perry Hill trails are very close), and a host of other activities, this beautiful log cabin has it all. There are 2 kayaks for you use on the Waterbury Reservoir or the Winooski River. This property is heaven for families, dogs are welcome. Spectacular sunsets, a pond, kid's club house, hot tub (winter only, Nov - March), sauna, exercise eqiupment, indoor shuffleboard , foos ball, brand new (2016) Hot Springs hot tub and every modern convenience makes this property a year round destination. Check In: Check in is 3:00 pm and check out is 11:00 unless otherwise specified. The location is heaven for skiing, hiking, boating, fishing, swimming, kayaking, mountain biking and relaxing! There is a large pond suitable for swimming and a children's log club house at the water. The hot tub seats six and there is a sauna as well. Gordon’s House was as advertised! Having 10 beds was awesome for a large group. Amazing views, great hot tub, and all the cooking amenities you would need. Nice and rustic cabin off the beaten path. Mountain views and plenty of amenities. Great place. We stayed for a long weekend this March and everything was great. The house was spread out and very comfortable. Originally we were supposed to have 4 couples and a child on the trip, but it turned out to only be 5 of us total. Even if everyone had made it, the house would have not felt crowded at all. We arrived in the middle of a late season snow storm and they aren't kidding when they say you need 4 wheel drive and good tires! The driveway was plowed, the shovels were ready and the lights were on for when we arrived. The house overlooks a beautiful sloping property (great for sledding) and absolutely stunning mountain views. It is close to the Shaws and the gas station, as well not far from town and attractions like Ben n Jerry's ice cream factory. We decided to go to Sugarbush for skiing, which was about 35 min away and I think Stowe mountain is even closer. The hot tub was great for after skiing and watching the sunset behind the mountains. The house had everything we needed, the kitchen was organized and supplied and directions for the house were clear. Some of the doors are hard to push closed all the way, so just be sure to hear the door latch click. There was plenty of wood easily accessible for the wood burning stove inside and the downstairs had a great game room (foosball, shuffle board, tv, sectional, ring and hook game) and fitness area with a treadmill, free weights and a weight machine. The owners were responsive with any questions we had prior to the trip and I honestly couldn't have asked for a better end to the winter season. Thanks so much! Great Views and felt right at home. We had a great stay at this property. The living room was a perfect place to sit by the fire and just be with family and take in the amazing view this place has to offer. This place looked as good as the pictures! Could not have asked for anything more, the perfect mountain house. Close to plenty of stores and ski mountains, but at the same time still adequately secluded and private. Hope to stay here again! We had a wonderful trip to Waterbury/Stowe! The house has a wonderful, open layout that is perfect for multiple families or groups. Each of the three floors has at least one bedroom, a bathroom, and a living space. The basement is well equipped with a workout area, shuffleboard, and Foosball table. The location and views are tough to beat - as advertised! Gordon and Missy were wonderful hosts. They accommodated our every need, and it was obvious they've put a lot of thought and care into making this property welcoming. If I had to pick one con, it would be that the Foosball table was quite broken, and could use some TLC. 10/10 would stay again and recommend to a friend! Located next to a State Park, minutes from a beautiful lake with fishing, boating and swimming. The area is minutes from 4 ski resorts, hiking, mountain bike trails and numerous golf courses. Tourists attractions include Ben & Jerry's Ice Cream Factory, The Cold Hollow Cider Mil and all that the Stowe area has to offer including the 15 mile bike path. Close to Burlington airport, University of Vermont, Lake Champlain and 1 1/2 hours from Montreal 3 hrs. from Boston. This truly is a 4 season rental. 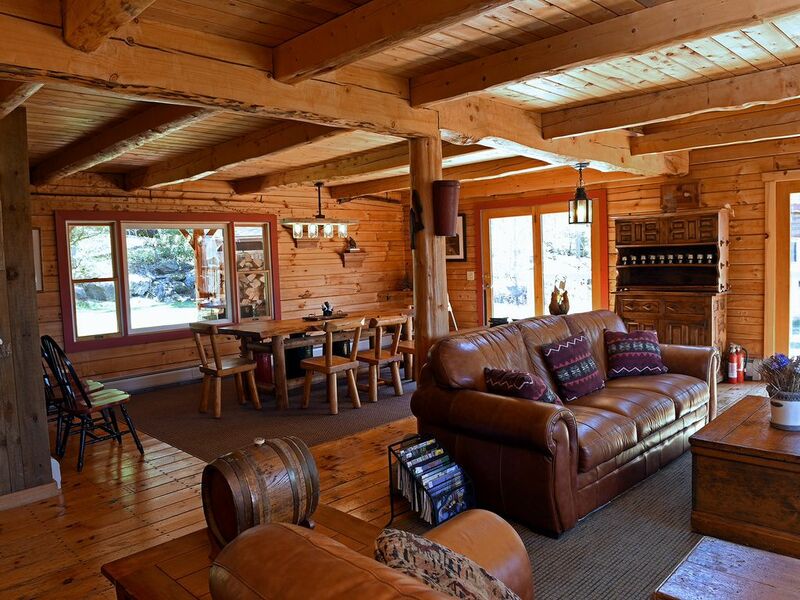 A rustic beautiful log cabin with all the modern amenities and a spectacular view of the Green Mountains.